Who would have believed that a language dead for nearly 2000 years would live again and be the national language of the reborn Promised Land; Eretz Israel? But why is the Hebrew language of interest to the Christian and why are some of us so hooked on it? I am sure our friend Amnon is right when he says, "Reading the Torah in a translation is like kissing your bride through a handkerchief." Once you have listened to a Bible teacher who loves Hebrew you become aware that so much richness of meaning is contained in the Hebrew words and constructions that several translations might be possible for a word or phrase but none will convey its fullness. Also, many who have heard Hebrew feel that there can be no better language in which to praise Eloheinu than in the language He used to communicate to His people. Even God’s names are so rich and full of praise. 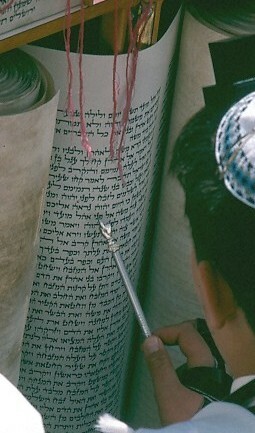 Hebrew is an ancient language that is written from right to left with a set of letters which does not include vowels. The first two letters are Alef and Bet, so the letters are an Alefbet. The Jewish/Hebrew scriptures were written without vowels, and the teachers and priests passed on the pronunciations verbally. It works in the same way that "Speedwriting" in English worked, by omitting the vowels – try it. In Israel today, the language written and spoken is also Hebrew, but the modern version is written without pointing and the spoken language differs in pronunciation of some letters. Not all Jews were happy about the use of Hebrew as an everyday language as they feel it is God’s language for worship and teaching. Thus some orthodox communities use Yiddish for everyday conversation and Hebrew for worship and Torah study. Certain letters are modified when they occur at the end of a word. The Masoretes, in around 700CE devised a system of dots which were placed under the letters which were followed by a vowel sound. This system is comprised "pointing" to give the vowel sounds and "cantillation" to indicate emphasis etc. This fixed the texts to the accepted pronunciation of that time. This is the form in which you will encounter the Tanakh. Put simply, the vowel sounds are as follows. Sounds like as in . . .
Two dots, one above the other, signifies an ultra short sound that is effectively a very short break. This is called a schwar. In transliterations it is written as an apostrophe. eg l'yisrael , meaning "of Israel" or "for Israel". Hebrew differs from Greek in some interesting ways. For instance, there is no separate word or concept for heart and mind, sacred and ordinary. Thus the language reflects the way of thinking; the Greek pattern we have inherited separates heart from mind while Hebrew thought does not. The same is true for sacred and ordinary, which are not separated in Hebrew thought, so all of life is to be enjoyed for God. The author is not a qualified Hebrew reader, speaker or writer; merely an enthusiastic beginner. However, the following may be of assistance to others who wish to try Hebrew. The author recently attended a series of eight evening classes, which aimed to teach enough basic understanding to allow the student to read the words well enough to be able to look them up in a dictionary and painstakingly read and understand the text. Look out for courses near you. See also Jot and Tittle, below, for Kesher courses. If you can obtain a Siddur (Jewish prayer book) you will find lots of scripture portions and prayers in Hebrew and the local language. This can help you learn or practice. Notice the similarity or family resemblance between Hebrew and Aramaic. There is a body of opinion that Jesus spoke Aramaic, not Hebrew. The way this idea comes out in the New International Version of the Bible suggests that the translators had an anti-Jewish, anti-Hebrew agenda stemming from the church's history of cutting off its Jewish roots. There is no reason to argue that Jesus did not speak Aramaic, since he grew up in cosmopolitan Galilee. He probably knew Greek too. But, remembering that he taught the Jewish people from the Hebrew scriptures, it is ridiculous to infer that Jesus was not a Hebrew speaker. There are web sites, software packages and books which may enable the student to teach himself / herself. You will find www.biblicalhebrew.com will be very interesting. Hebrew for Christians gives wonderful insights into the language itself and the truths conveyed by it. It is a site for learning Hebrew or for getting a taste of the language. Other features include Jewish humour and Yiddish. 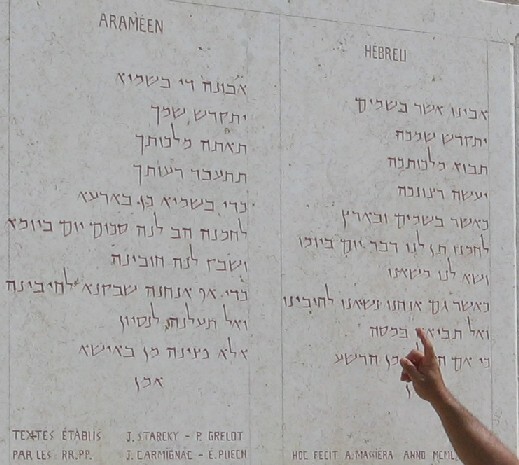 Makor Hebrew Foundation aims to empower Jews and Christians to grow spiritually in their understanding of Scripture through the exploration and examination of the Hebrew sources of their respective faiths. The HTML Bible web site offers an interlinear Old Testament with both modern Hebrew and early Hebrew plus transliterations. The KJV used the expression "jot or tittle" but the reference is actually to the letter Yod (the smallest letter) and to a the smallest detail of a letter. You are welcome to visit their website for more Word By Word Bible Study. Learning to speak modern Hebrew can be undertaken in various ways but the author has been advised that the best way is by living in Israel for a while, and possibly doing an Ulpan course. Many Israelis had to learn the language that way after making aliyah. 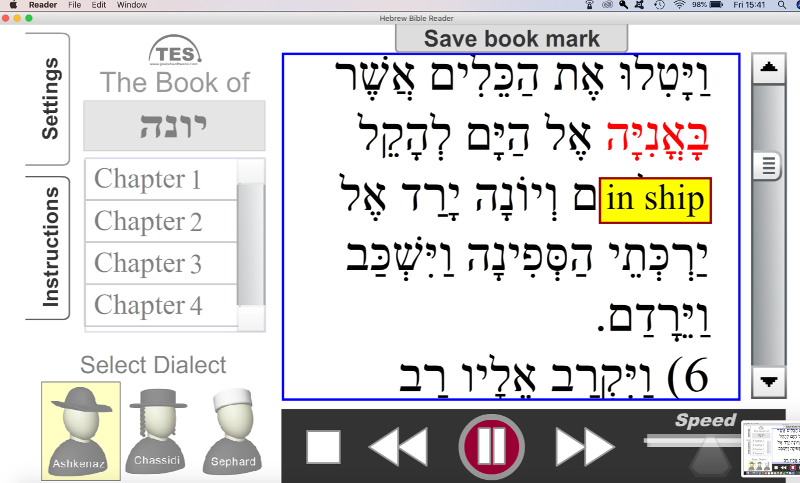 Hebrew on line - learn Modern Hebrew or Biblical Hebrew - apparently no longer available under this name. For a professional language course, face to face with on-line tutors in Israel, sign up with Classical Hebrew.com or Hebrew Online.com . By telephone or Skype with a personal tutor. It is possible to pick up Hebrew worship, learning the phrases and words, by joining with Messianic groups or gatherings such as the ICEJ Feast of Tabernacles. If you want to be able to type and print Hebrew, you can do it on your PC. Windows and Word can be enhanced to allow the use of Hebrew fonts, a Hebrew keyboard layout and right to left typing. See foot of page for some experiences. At http://jwit.webinstituteforteachers.org/hebrew%20in%20Windows.pdf you can get the instructions for setting up various versions of Windows. A system that has been around for a while is the software made available through SIL. By downloading and installing Hebrew fonts, a Keyboard modifying programme and a Hebrew keyboard module it is possible to make Microsoft Word type Hebrew. The process requires quite a bit of perseverance, but the results are effective and the utilities are freeware if they are for home/student use. The Hebrew text on wildolive was produced utilities from SIL (Summer Institute of Linguistics). The author has not mastered reading, speaking or typing Hebrew, but remains fascinated and enthusiastic.